My father was from St Helens and a professional rugby league player. Before his career as an athlete he was in the Royal Navy. The other sailors called him ‘Scouse’. The three miles between the two urban boundaries of Liverpool and St Helens were inconsequential for sailors on an aircraft carrier in a distant ocean. On Merseyside the three miles ensure mutual antipathy. As well as accent and size, sport divides Liverpool and St Helens. Jurgen Klopp is the new manager of Liverpool Football Club. My father told me that St Helens schools taught Roman Catholicism and rugby league and nothing else. This is an exaggeration but, thanks to Flemish glassmakers, there is a high percentage of Roman Catholics. Whatever the religion, all in St Helens appear to be obsessed with rugby league. The folk of St Helens and Liverpool may dislike each other but they are passionate supporters. The City of Liverpool has overachieved in football, and so has St Helens in rugby league. It has won six League Titles since 1996. The team would have won more except it has a poor record in play off finals. Local landowners shaped the history and boundary of St Helens. It consists of four manors. Outsiders assume one identity for the population of 107,00 but people from St Helens are obliged to mention the manor in which they live. None of the manors are prosperous. The people of St Helens vote Labour. The Tories stay silent to avoid criticism. The absence of coal in Liverpool helped the North West to resist the economic spread of the City. The mining industry of St Helens was terminated by Thatcher but the left wing identity remains. Crime in St Helens has declined since 2008, as it has across the UK, but local crime figures are below national averages. Pedestrians can walk in safety around a not that interesting town centre. It is not the equal of nearby Wigan. Celtic Brigantes was the tribe that inhabited the North of England when the Romans arrived. The Romans chose to settle in Wigan rather than St Helens. Anyone who has seen the two town centres would understand why. St Helens, though, has had international reach. Pilkingtons Glass dominated the global industry and was sued by the United States Government for creating a cartel. The exhibitions in the Glass Museum in St Helens reveal pride in innovation but neglect to mention the aggressive use of patents. Pilkingtons once provided work for 15,000 people in St Helens but today that number is less than a thousand. Beechams produced pharmaceuticals and it also became a global giant. 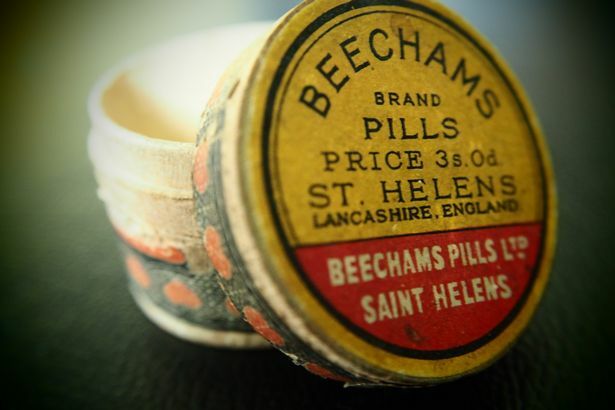 Beechams Pills were used across the world and recommended to those who wanted ‘to dislodge the bile and stir up the liver.’ According to adverts ‘the wild waves tell you to try Beechams Pills.’ St Helens is eleven miles from the coast but someone had an imagination. Beecham Clock Tower is the name of the building where people dreamed of stirring up livers. It is now open to the public, and the staircase and extravagant wood panels justify a visit. Posted in Beechams Clock Tower, Beechams Pills, Celtic Brigantes, Citadel St Helens, Jurgen Klopp, Liverpool FC, Margaret Thatcher, Pilkingtons Glass, Salvation Army, St Helens RLFC, United States Government, Wigan and tagged Culture, politics, travel, UK history, uk travel on October 10, 2015 by Howard Jackson.